- Publisher Torrey examines some of the difficulties surrounding the Bible, and he explains how we should deal with them when they arise. Each chapter focuses on a different passage of Scripture and provides an illuminating perspective on the biblical text. Torrey will draw you into his exploration of the truth and the real facts of the Scriptures. 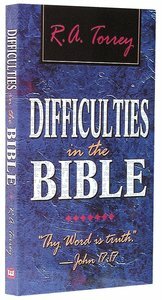 About "Difficulties in the Bible"
Customer Reviews For "Difficulties in the Bible"
This book gives solid reasons that demolish problems throughout the Bible. Since it was written decades ago, he did not know the research that has been done to argue against millions of years for the age of the earth so he allowed for pre-Adamic creatures. Other than that flaw, this book is well worth reading. Once again, the Bible has been shown to be the Word of Almighty God.